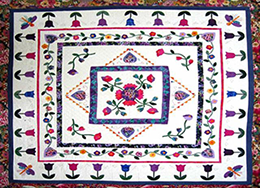 Patchwork quilts are probably the most common type of quilt throughout North America. Patchwork quilts can range from being super simple to incredibly complex, incorporate all materials and colors, and come in the broadest range of patterns and designs. 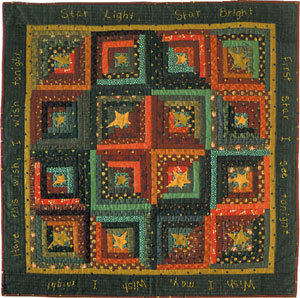 Patchwork quilts generally work in blocks and are based on a pattern. Some patchwork quilts use the same pattern for each block only changing the materials or color scheme, others alternate the same patterned blocks through the quilt, and then there are quilts which have a different patchwork pattern in each block. Even after you find your pattern you must still spend some time on choosing your color scheme and materials, it is very important to try and lay out as much of the material you can to ensure everything fits together properly and looks good. The great thing about using a patchwork quilt pattern is that before you start you are given dimensions of each piece of fabric you will need to use. This means that if you are buying any fabric you know exactly house much to purchase. Remember you can always get a little bit more for when you create a scrap quilt later on down the track and want to have a piece of each of your quilts in the finished result. Check out the patchwork quilt patterns and books below for inspirational ideas and creative sources that will keep you busy for years! Your First Quilt Book (or it should be!) - If you haven’t got a clue about quilting, then this is the book for you! Written for beginning quiltmakers (and those who want to brush up on the basics), Your First Quilt Book introduces all the tools, supplies, and techniques you need to create simple patchwork quilts. Perfect Quilts for Precut Fabrics: 64 Patterns for Fat Quarters, Charm Squares, Jelly Rolls, and Layer Cakes - Make the most of fat quarters, fat eighths, 5″ and 10″ squares, and 2 1/2″ strips. Suit your style with 64 different projects, brilliantly organized by the cut of fabric. Enjoy specially selected designs that are ideal for precut fabrics—or for cutting your stash down to size. Patchwork City: 75 Innovative Blocks for the Modern Quilter • 6 Sampler Quilts - Tired of sewing the same old blocks? Here’s what you’ve been waiting for: a bonanza of 75 modern quilt blocks from best-selling modern designer Elizabeth Hartman. You’ll love these fresh angular designs inspired by city life, and the mix-and-match possibilities are endless! Elizabeth gets you started with 6 complete sampler quilts to sew. Each block is shown in 3 different fabric palettes. The book includes easy-to-follow cutting charts and instructions for every block. Some have full-size freezer-paper templates. Change up blocks, sizes, or fabrics to embark on a limitless exploration of modern style. Fabulously Fast Quilts - Popular blogger Amy Smart shares the tips and techniques she uses to quickly create complex-looking quilts. This go-to collection is ideal for beginners as well as experts who want to make a striking yet speedy quilt. Enjoy 12 versatile designs that have lots of movement and work well with many styles of fabric—a terrific value. Choose from three quilts in each of four shortcut categories: strip piecing; quick corners; slick slicing; and stack, slice, and shuffle. Find enticing patterns in various sizes; many use precuts and scraps. The Cotton Patch has a great array of patchwork patters for all levels. Patchwork Times offers a number of great free patterns. They also have a great chart to help you determine how many squares you can get across the width of fabric. Glorious Color is one of my favourite websites as it heavily features the works of Kim McLean, Kaffe Fassett, Phillip Jacobs and Brandon Mably. They aren’t strictly focused on patchwork however it is all worth having a look at if you haven’t before! If you are looking for a quilting instruction video for patchwork quilts then check out Ludlow Quilt and Sew. For Quilt Blocks Galore, check out the Quilters Cache where you will find loads of simple and easy quilt blocks ready to be put together into a fabulous new quilt.